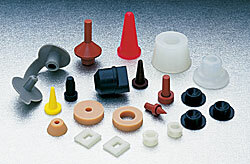 Rubber products are very prominent in StockCap's product lines. Some commonly molded rubber materials include Silicone, EPDM, Nitrile (NBR), Neoprene®, Hypalon®, SBR, Viton®, and natural rubber. These materials are particularly effective in the masking process, being able to withstand high temperatures without contaminating paint lines. Depending on the quantity and material involved, StockCap will utilize its compression molding, transfer molding, or injection molding processes for rubber parts. One of the simplest and least expensive ways to produce molded rubber parts. While it is not typically recommended for complex parts requiring tight tolerances or flawless finishes, it is very cost effective method for manufacturing lower volume items. For more information, please visit Benefits of Compression Molding or visit our Rubber Molding Section. Very similar to compression molding except that the material is pushed or "transferred" into the cavity by a piston instead of being directly placed into the mold as it is in compression molding. The added control in this process allows it to produce more complex parts with tighter tolerances and more consistent surface appearance. On the downside, the tooling is typically more expensive and it tends to operate at slower speeds than compression or injection molding. Rubber is very similar to injection molded plastic. The process is the best choice for complex high volume products that require tight tolerances. The piece prices for injection molded rubber parts are often very competitive if the volume justifies the more expensive tooling and set up charges.